The Mjölnir, and the first “true” hammer, were born from the collision of the two moons. New Mjölnir are entrusted with a tiny fragment from that collision, which is then used by crafters to imbue into their iconic weapon. 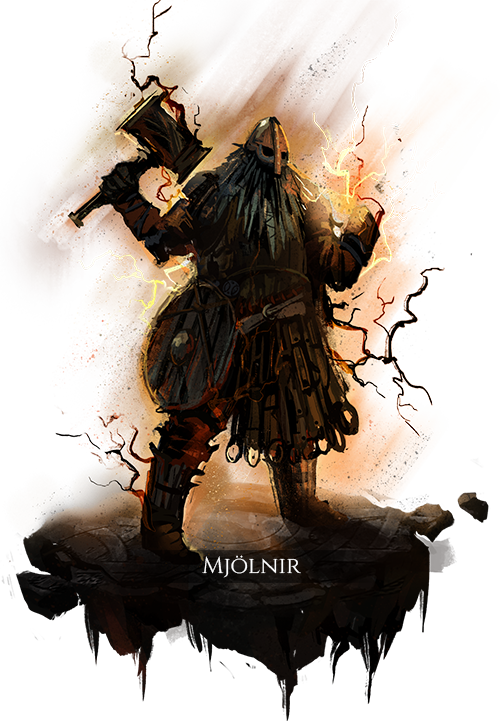 Mjölnir are reputed to focus on causing destruction rather than on the more protective aspects of their occupation, and that’s just about right as far as they’re concerned. These men and women have a long tradition of taking their anger out on their enemies. Wearing heavy armor causes damage feedback from the use of lightning attacks, based on heavy armor damage mitigation value. Incoming damage is greatly increased during channeling. During storms, lightning damage and stamina regeneration are greatly increased. Use of lightning attacks grants a physical buff that increases movement speed and damage mitigation based on the power of the attack used, for a brief duration. Inflicts direct lightning damage and disruption damage, and arcs to nearby targets within a short distance with reduced power. Channel to charge a weapon with power, which will be expended over the next few strikes. Channel to throw an equipped weapon at the target and cause it to return after striking. Strikes against a target grant a physical escalation buff that grants bonus damage to each subsequent strike within a brief period of time. Unleashes the power of all elemental buffs and debuffs on the user, as a devastating lightning-empowered attack. Causes an equipped hammer to explode when the user dies, dealing high crushing damage to all nearby enemies based on proximity, knocking them back, and then reforming the hammer.